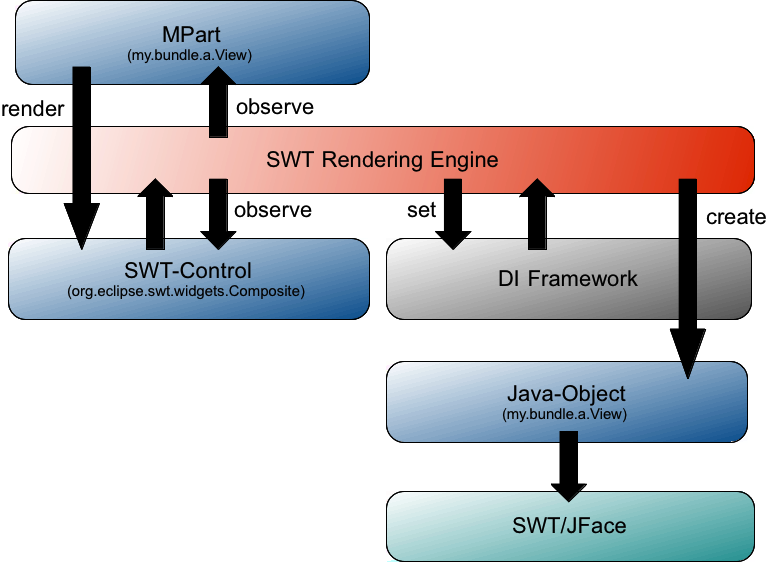 In my last blog post I talked very short about the relation of XWT and the Eclipse 4 Application platform. It looks like many people are mixing things up. 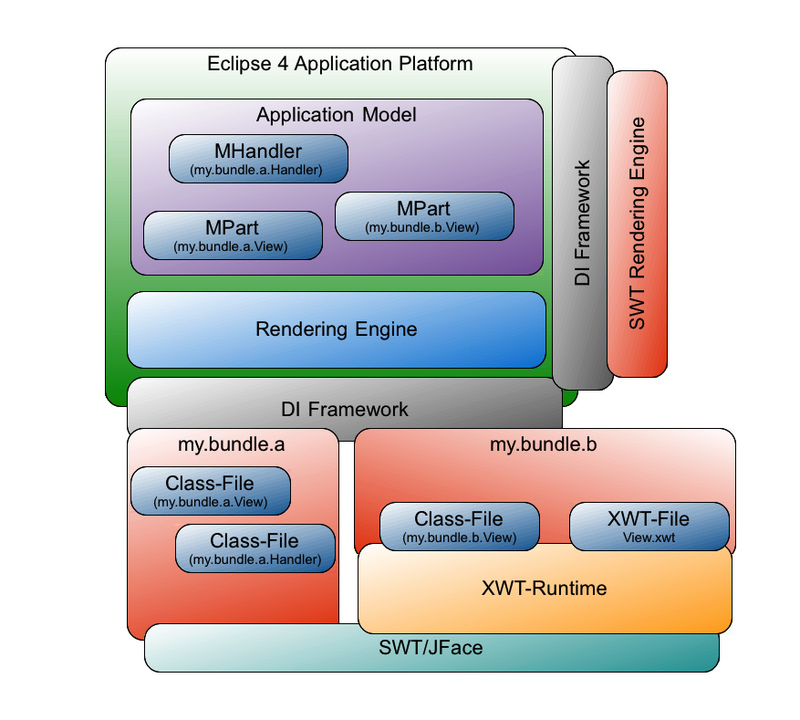 In this post I’ll try to give a deeper look into the Eclipse 4 Application Platform which might make even clearer why XWT is not necessarily part of a Eclipse 4 application. I can only reiterate that the Eclipse 4.0 Application Platform (EAP) is not forcing you in a direction or technology (it even not force you to use SWT though for many applications this might be the natural choice). Let’s look at the big picture at first. An interesting fact though is that you also use this very same Application Model at design time which is in complete contrast to Eclipse 3.x where you use the plugin.xml-Model to describe your application. The default format we use to persist the model at design time is XMI which is supported by EMF but in the end the EAP does not really care in which format the Application Model is persisted all it needs when starting up is an in memory instance of the model. Now let’s go on to see what the EAP does with the model and how it creates the UI out of this abstract information. As outlined already the Application Model holds UI-Information but what you find in the model are abstract UI-Concepts like Window, Perspective and PartStack but does not talk about concrete widgets to used to implement such a concept in the UI presented to the user. The transformation (we call it rendering) of the model elements into concrete widgets is the responsibility of the Rendering Engine . 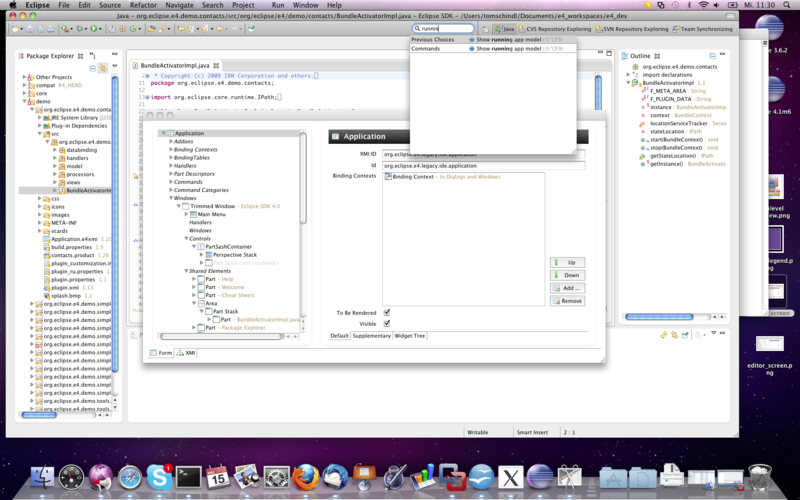 There are a lot of talks at EclipseCon 2011 and I’m giving a tutorial together with Kai Tödter and Eric Moffatt where you can learn how to write applications using the Eclipse Application Platform. This entry was posted in e4. Bookmark the permalink. There are lots of people with RCP applications who I am sure, like me, would love to move across their existing editors, views etc. into e4 EAP. A clear focussed tutorial on how to do this will be of great benefit to us. To be able to have all Commands, Menus, layout etc. nicely abstracted in the EAP model and thus isolate your custom views is going to make maintenance of what are currently really quite complex RCP apps much easier. I’ll try to update my Tutorial e4 RCP Application tutorial when we ship 4.1 and if possible publish a tutorial on how to use parts of e4 even with 3.x (DI is one of those) but because I’m doing this in my spare time I can’t promise. I think the modeltooling is entering a state now that all major features I wanted to implement are in and I can once more work on other fundamental stuff. Thank you for your great BLOG!!! 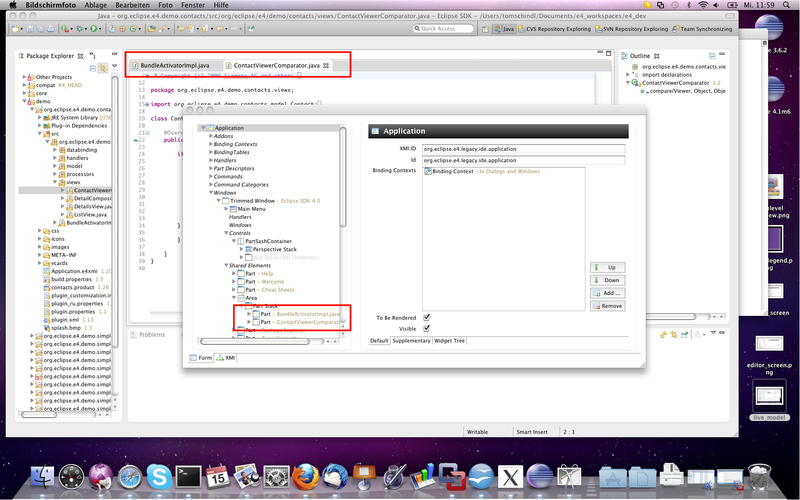 What do you think about integration of RAP to eclipse SDK 4? There are some problems when running RAP on the Eclipse 4 Application Platform. The most prominent is that one needs to replace the default IEventBroker through a RAP specific one because the default one uses the OSGi-EventAdmin which is a framework singleton and hence all RAP-Instances would communicate through the same channel.